← Strange Object Found in Old Magnesium Mine “Google Earth” Photo. PHOTO OF WATER DROPLETS. VERIFIED THAT ABOVE PHOTO WAS OF WATER DROPLETS. Description: Hi Bill: I thought you would be interested in seeing this photo taken by the east-facing motion-activated camera (Reconnyx Hyperfire 900 trail camera) on the corner of the house. The cameras are set to record 20 photos less than 1 second apart when motion activated. I just picked this one up as I was reviewing photos obtained since I last reviewed on 11/3/15. These 2 bright spots were not seen in the photos immediately before or after this one and nothing was captured by the south facing (identical) camera. Call me if you have any questions. 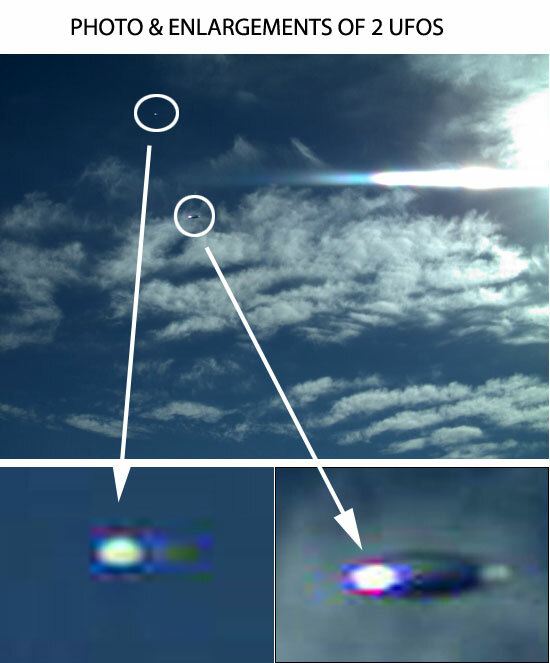 Second Report by Witness: The sun was definitely to the right of the two objects. The right end of the object appears to be reflecting the sunlight. The left end, with a much brighter light – to me this looks like a light source. If this is a genuine UFO could the glow on the left end be related to the propulsion system? The smaller and apparently more distant object above the larger one appears to have the same configuration. The larger object, when increased in size up to 200%, appears to have a small, but perfectly circular and fairly well defined “port hole” appearance to me. Note: The above photos were taken by one of the trail cameras (Eastward facing) operated by Dr. Richard O’Conner. Dr. O’Conner monitors airspace with cameras around the Jesse Marcel Library located in Clancy, Montana (a few miles South of Helena, Montana). The library was started by Richard O’Conner in memorandum of Jesse Marcel Sr. and Dr. Jesse Marcel Jr. (Both men are of Roswell fame.) He regularly parses through photos to see if anything unusual is detected. This requires considerable effort and time. Dr. O’Conner is a UFO and crop circle researcher and regularly facilitates UFO meetings at the library. He has a crop circle website: Click here to access Dr. O’Conner’s crop circle site. Dr. O’Conner is an anesthesiologist and just recently retired from practice. Note on Photo: Enlargement reveals that the objects are quite similar in appearance. The objects were only in the field of view of the eastward facing camera for (at most) 1/20 seconds. The cameras are triggered by motion and will snap 20 frames/second. (See discussion above.) The Sun was to the right of the objects and the photo shows a reflection on the right hand side of both objects. Both objects show a pronounced bright spot on the left end which could be an energy or light source and not a reflection. Today was the first day since November 4 that I felt it was safe to go up on my (really high) rooftop to try an experiment. The snow and ice that have been up there for so long had finally melted. I took a turkey baster and a jug of water up there to prove to myself that the November 4, 2015 Reconyx photo M 5/20 of what I was convinced was a genuine UFO was, in fact, a genuine UFO. I chose today not only because I had time to do this experiment at around noon, the time when the original Nov 4, 2015 “UFO” photo M 5/20 was captured, but also because the current altitude of the sun is very nearly at the same angle / altitude as the sun was at around noon on Nov 4, 2015. I felt sure that if the water dripping, drop by drop, from the turkey baster would trigger the Reconyx camera, then we would see that those drops would look nothing like what I think we all believed was a genuine UFO captured in the November 4 photo M 5/20. I just felt certain of this. Well, the drops did trigger the camera and, much to my (I’m going to say extreme) disappointment, the drops of water captured by the camera look almost exactly like the Nov 4, 2015 M 5/20 “UFO” photo. I am now convinced beyond a shadow of doubt that the Nov 4 photo M 5/20 was, in fact, simply and only a couple of falling raindrops fortuitously (or not) captured by the Reconyx camera. Why all of these images of the water drops appear as flattened ovals rather than spheres I cannot explain, but this is (image below) what the camera recorded this afternoon. This must have something to do with the acceleration of the water drops combined with the camera’s shutter speed. It is difficult for me to put into words just how disappointed I am about this news, especially when I consider just how many people, including myself, were truly fascinated by the Nov 4, 2015 photo as well as all the time and effort I have put into going over all of these (>280,000) photos. Below is shown one of the photos captured today – a whole fleet of “UFOs” extruded from a turkey baster! 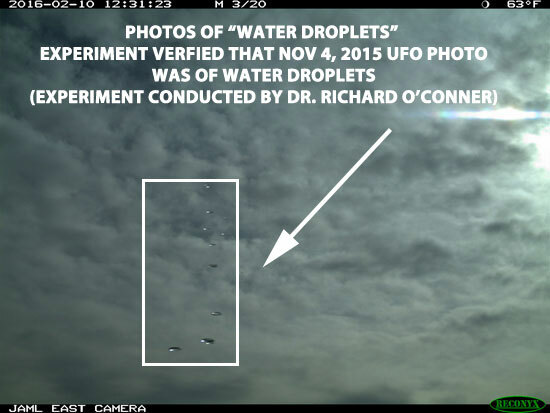 On a slightly brighter day with more blue sky in the background (a day like Nov 4, 2015 was) I feel certain that these “UFOs” would look exactly like the “UFOs” (water drops) captured on Nov 4, 2015. I also have a set of high quality security cameras (Geovision Brand) which monitor airspace in all directions. I live in the Helena Valley which is about 6 miles North-Northwest of the Jesse Marcel Library. My cameras did not detect anything on the same day. This suggests that the objects could have been quite close to the Library and may have been too low on the horizon from my vantage point. This photo is an interesting one. The colors of the object resembles the surrounding blue sky and clouds. This would naturally occur with highly reflective silver objects. The fact it was 1/20 second frame rules out balloons or other man made objects. It also indicates the objects decelerated and accelerated and held position for just one frame, as there’s no elongated motion line that would have occurred if the velocity was constant.I’m sure some will say it’s one frame of hot pixels; which is impossible for just one frame and a wide selected zone of linear pixels.Some will say it’s a digital recording artifact; this is not possible because the pixels comprising of the objects are linear with gradient fall off.When all other explanations are ruled out the proverbial “flying swamp gas” explanation is offered, and this is done by those who choose to ignore the laws of physics.